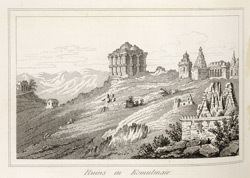 Etching of Kumbhalgarh, drawn by Patrick Young Waugh (1788-1829) and etched by James Sargent Storer (1771-1853). Plate 22b from James Tod's: 'Annals and antiquities of Rajast'han or the Central and western Rajpoot States of India' published in London in 1829. In 1818 Mewar and other princely states of Northern India signed a treaty with the British, and Colonel James Tod became the first Political Agent to the Western Rajput States. Along with his official duties, Tod became very interested in the genealogies of the Rajput Kingdoms as well as the art they produced. The spectacular Rajput hill fort of Kumbhalgarh is perched on top of the Aravalli Hills and reaches a height of over 3000 feet. Built in the 15th century by Maharana Kumbha (1419-63), the complex extends over 12 km and includes many palaces and gardens. The Fort has seven majestic gates and seven ramparts that are reinforced by rounded bastions and huge watchtowers. Inside the periphery wall there are over 360 temples, a large number of these being Jain.